As always a big menagerie of stuff in this weeks auction! Including automotive and shop items, tools, household, rare and common stuff in this auction. If you're bidding on the big stuff, why not pick up a few of these 99 cent specials when you come for the other pieces! No set preview day. If you want to come by and take a look at something specific, need a measurement or have any questions, please call 913-219-3960 any weekday to make an appointment. Package of 12 individual clear 2-1/2” X 3-1/2” hinged plastic tags designed to attach to pallet racks or shelves providing a great place for your price or inventory tags. These come together as a pair and can be used that way or pulled apart for the 2-1/2” X 3-1/2” size. Peel the strip off the adhesive and stick it on about anything. New package of 25 Yellow zinc plated Grade V 3/8" -16 coarse thread bolts with 1" of threads. New package of 25 Yellow zinc plated Grade V 3/8" -16 coarse thread bolts with 1" of threads. If you work on hot rods or trucks, this might be the most popular size required. 10 new sheets of the Poly clear heavy 10 mil thickness notebook or picture frame covers. 10 new sheets of the Poly clear heavy 10 mil thickness notebook or picture frame covers. These measure exactly 8-1/2” X 11” and have lots of uses to lay over photos, flyers or create the cover on a presentation book. Package of 10 Small plastic pillboxes with a lid that attaches to your key chain, purse or whatever. Never leave home without it that way. Carry your medication or just a few pills to tackle that surprise headache or other ailment that may come along. Has a tight moisture proof lid. Not sure what the original application was for this jacketed cable but with a little engineering it makes a great hot rod or race car throttle cable. 21” overall length and with the “S” (3/16” OD) hook on one end and the “L” (1/8”) hook on the other. High quality swaged ends and very flexible stainless cable. 1-1/2” length of 5/16” fine thread adjustable position sleeve. About 3-1/8” of travel. I’ve shown this cable installed on a Holley and Edelbrock carbs with the threaded sleeve on the carburetor end. It can also be reversed and anchored at the back. No reason it can’t be used from the linkage rod or throttle pedal for fuel injection systems. Anchor the housing on the other end with a “C” clip or clamp. Package of 4 new JBC 1" 90 degree schedule 40 Street Elbows PVC1 tubing fittings. Package of 4 new JBC 1" 90 degree schedule 40 Street Elbows PVC1 tubing fittings. Make or plumb something with these or just put them on the plumbing truck for a future job. Set of 4 new of the HB1 Bright 9004 EIKO Xenon Gas replacement head light bulbs. This package of 4 will give spares or trading material with your friends. These are the powerful bright White replacement bulbs for the 9004 (also known as HB1) EIKO Xenon Gas head light bulbs that replaces the stock headlight bulbs. This 9004 super light bulb produces high wattage light output with a standard watt current drawing. This is not the Extreme Blue bulb but does provide a brighter, much stronger light than the OEM bulbs. This is the 12V-65/45W that directly replaces your stock light bulbs, and is a perfect upgrade for your vehicle. The 9004 headlight bulb is used in many vehicles. Easy to check yours to make sure these bulbs are correct for your application. Cool plain stainless steel money clip. I kept the cash and going to sell you the clip. Cool plain stainless steel money clip. I kept the cash and going to sell you the clip. Cool deal the way it closes up and tucks the bills into the folded stainless steel clip and locks the bills in place when it snaps down. Experience the coziness of a real wood fire with this Fireside Reflections DVD. Choose to watch your fire from its roaring beginning to its smoldering end, or select endless looping of the three fire phases. Enjoy the sounds of authentic fire crackles and pops, or add some holiday flavor with favorite Christmas songs beautifully performed by the Saint James Harp Quartet. New in the package is this Casino Royale 007 Blu-ray Daniel Craig Eva Green James Bond Mads Mikkelsen. Be sure to check out the Youtube video trailer. 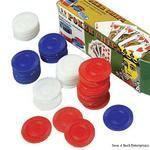 Interlocking ** Washable ** Easy Stacking ** Please note: There are many grades of poker chips on the market. Please understand that these are economical thin plastic chips. These are plastic inexpensive chips for cheap way to play for your poker games. These basic generic chips and are not to be compared to high quality chips as these are NOT heavy clay chips. Most likely will be a fraction of the cost compared to the real casino chips. If your on a budget to get the most chips for the money this is it. The box is a nice colorful display box. Brand new nice heavy duty soft sided case actually designed originally for carrying and handling electronics equipment. Let you imagination go on one of these maybe for pizza delivery because the 5 separate divided compartments are very well padded and insulated. Provides technicians, drivers or what ever your use is the ability to store and/or transport in a case with handles on 2 side and a HS zipper on the top for quick access. Manufactured of durable ballistic nylon. Water-resistant construction protects the cargo from damage and mild environmental hazards. This equipment case features side lifting handles allowing it to be carried as a tote. The built-in abs plastic dividers are covered with a non-snag fabric cover and divide the case into 5 separate 17. 25" x 3’’ compartments making it ideal for transporting anything that will fit. Additional features, of this equipment case, include a front exterior pocket that is divided into 5 sections secured with a Velcro flap. A scuff-resistant bottom protects contents as well as surfaces under the equipment case. Made by Specialized Products this case weighs 15-pounds and measures 20’’ x 20’’ x 18’’. Cool looking and new padded professional portfolio with an 8-1/2 X 11" paper pad ready for work already installed. You got one of these FREE when you paid the $25,000 tuition at Davidson College and you get to name your price on it here. Another one of those collectable hat or lapel pins most are finished with wild porcelain colors. Another one of those collectable hat or lapel pins most are finished with wild porcelain colors. The photos are going to do the talking. Another one of those collectable hat or lapel pins most are finished with wild porcelain colors. Look the photos over real good and put your bid down. Payments: Cash is welcome at pick up. If your invoice is not paid after the posted pick up day, we’ll process your payment using the credit card you have registered on Equip-Bid. 15% Equip-Bid buyer's premium is always added to your invoice total before sales tax to establish your total invoice price. Equip-Bid and or Dale Wilch Sales Co will collect and remit sales tax for the state unless we have your proof of exemption here on file prior to payment, regardless of the asset type or its intended use. You can email your Sales Tax Exempt for to dale@dalewilch.com or mail to P.O. Box 12031, Kansas City, KS 66112. After the posted Pick Up date and time of your won lots, we will hold your items for 3 weeks and require you to make an appointment (Phone (913) 788-3219) to retrieve your purchases. After that we assume you have abandoned your purchases and will dispose or list them again in an upcoming auction.